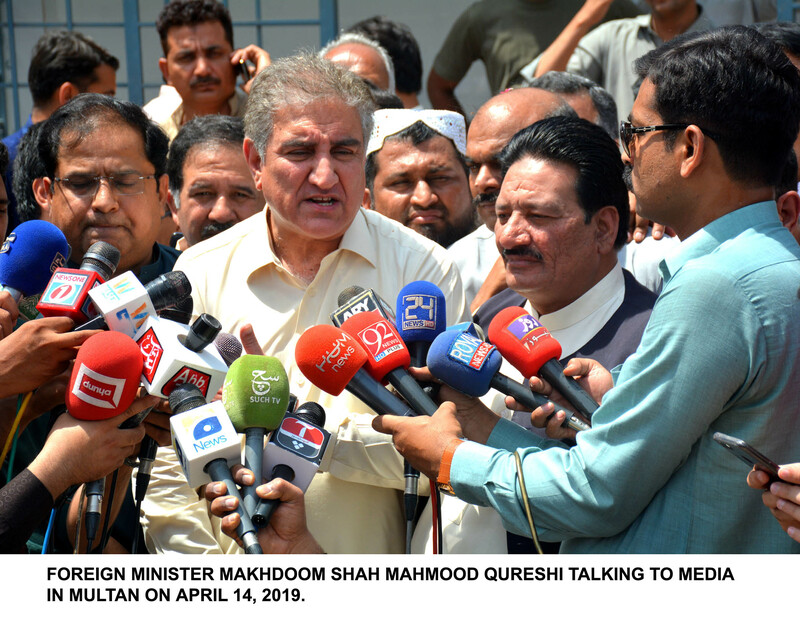 FOREIGN MINISTER MAKHDOOM SHAH MAHMOOD QURESHI TALKING TO MEDIA IN MULTAN ON APRIL 14, 2019. Foreign Minister Shah Mehmood Qureshi has stated Pakistan is a responsible country and it will not act like India who issues irresponsible statements. Talking to media in Multan on Sunday, he said Pakistan will investigate the Quetta incident thoroughly to trace culprits, whether foreign hands were involved or there was sectarianism behind this tragic incident. To a question about any threat from India, Shah Mehmood Qureshi said that election process in India will continue till 19th of next month and there is need to remain vigilant. About Afghanistan, he said that Pakistan is playing its role for peace and stability in Afghanistan. The Foreign Minister said that Prime Minister Imran Khan will visit China to attend international forum in China, wherein, he would deliver a key note address as well. Shah Mehmood Qureshi said the Prime Minister will also hold talks with Chinese President Xi Jinping during his visit. He said Prime Minister will also visit Iran with in the next few days. The Foreign Minister said that he himself would visit Japan soon.